Weird Idea Wednesday: Are sentences like shopping carts? So this week’s weird idea is what happens if you use the “market basket approach” to studying transactional data and apply it to novels? The way it works in practice is every row in a matrix is a “transaction” and the items are columns. You then search for higher than normal co-occurrences. Given the number of times anyone bought beer, what are the number of times they bought diapers (and vice versa)? The more they occur together the stronger the signal (the “lift” in market basket lingo). 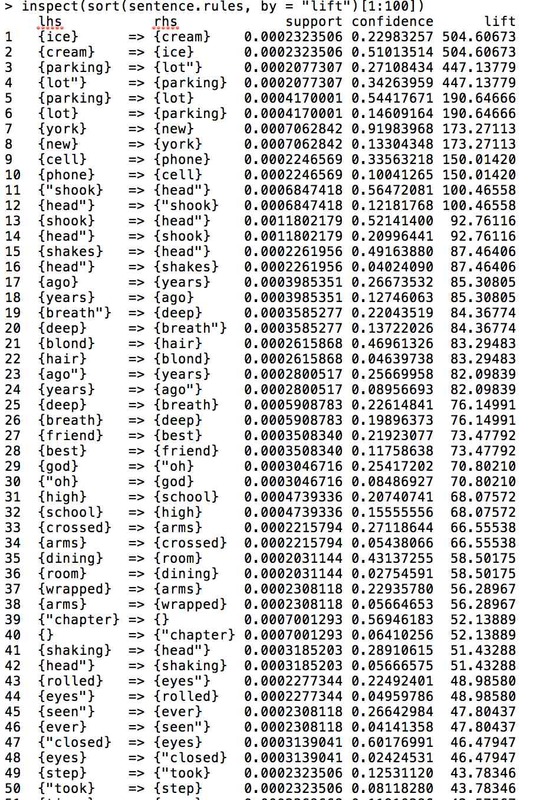 The values are directed, so the first word determines the likelihood of the second. Support = the percentage of sentences in the corpus in which one of these words is present and lift = the increased likelihood of finding them together. For the most part you get a lot of bigrams: ice-cream, parking lot, new york, cell phone, years ago, oh god, that sort of thing. The further down the list you go, you start to get the equivalent of skip bi-grams (closed [his] eyes, took [a] step). 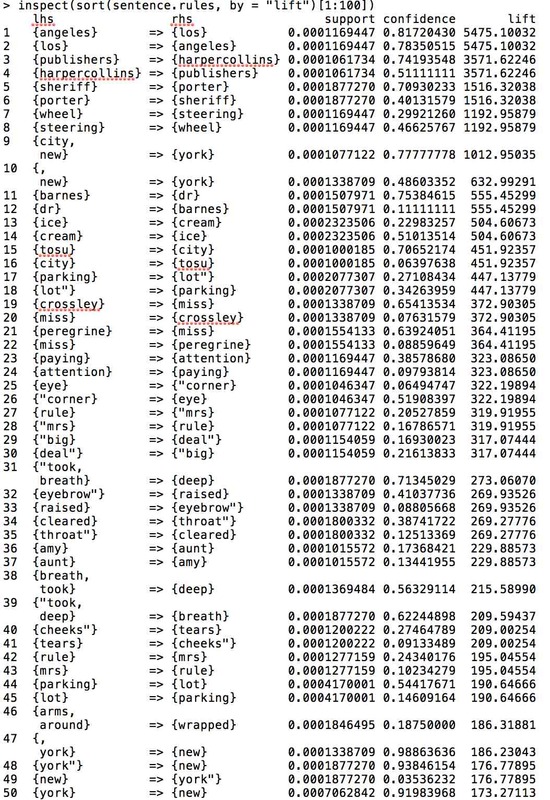 The second list, which has a lower threshold of being present in the corpus finds things like “tears” and “cheeks,” which are probably grammatically further apart (“tears rolled down his cheeks”). Needless to say, this seems like a lot of very uninteresting information. No secret buying habits of authors suddenly pop into view (parking and lots!! Eureka!). On the other hand, I was thinking that maybe this could be used as a cliché filter or novelty detector. How many “rules” are accounted for in your sentences and where are they on the scale of likelihood. The more often you talk about parking lots or things being seen out of the corner of someone’s eye, the more we know this is a cliché. Sometimes you can’t avoid it, but the more often it happens could be a sign that an author’s writing (or your writing if you’re an aspiring novelist) needs work. Or maybe clichés are important, especially to highly formulaic genres like YA fiction and bestsellers. Maybe being too original isn’t a good idea at all. Maybe there’s a study in there after all. Or maybe it’s just Wednesday. The New Young Adult Fiction. More Human, More Me.